عمل آوری بر روی تمام ویژگی‌های بتن سخت شده نظیر مقاومت و نفوذ پذیری تاثیر می‌گذارد. از این رو، در این مقاله به بررسی تاثیر شش نوع عمل آوری شامل: غوطه ور در آب، گونی مرطوب، گونی مرطوب به همراه نایلون، ماده عمل آورنده، بخار و رها شده در محیط آزمایشگاه بر روی نفوذ پذیری، مقاومت فشاری و پیچشی نمونه‌های بتنی پرداخته شد. بتن‌های مورد استفاده، از رده‌های مقاومتی 25C و 35C بوده که جهت تعیین نفوذ پذیری و مقاومت پیچشی آنها به ترتیب از روش‌های درجای محفظه استوانه ای و پیچش بهره گرفته شد. نتایج بدست آمده نشان داد که در عمل آوری رها شده در محیط آزمایشگاه، با کاهش 3/39 درصدی مقاومت فشاری و 31 درصدی مقاومت پیچشی نسبت به مقاومت مشخصه بتن، به میزان 62 درصد بر نفوذپذیری بتن افزوده می‌شود و در بین روش‌های عمل آوری ذکر شده، تنها دو روش عمل آوری غوطه ور در آب و عمل آوری توسط گونی مرطوب به همراه نایلون، قادر به تامین حداقل مقاومت مشخصه فشاری و پیچشی طرح بتن بودند. همچنین با افزایش مقاومت مشخصه بتن از 25C به 35C، از سرعت نفوذ آب در بتن کاسته شد. بیشترین سرعت و مقدار نفوذ آب در بتن، در عمل آوری توسط ماده عمل آورنده به ثبت رسید و کمترین سرعت و مقدار نفوذ آب در بتن، در عمل آوری غوطه ور در آب ملاحظه شد. Curing affects all the features of the hardened concrete such as strength and permeability. Therefore, in this paper investigated the effects of six different curing methods, namely immersing in water, abandoning in the laboratory, using wet burlap, wet burlap with nylon, curing chemicals, and steam, on the compressive and torsional strengths and permeability of concrete specimens. Applied concretes were C25 and C35 that in-situ cylindrical chamber used to determine permeability. Results revealed that the concrete abandoned in the laboratory had the worst curing condition regarding torsional and compressive strength gaining. In the “abandoned in the laboratory” method, permeability is increased 62% with 39.3% and 31% decrease in respectively the compressive and torsional strengths compared to their respective specified strengths. Only two curing methods, i.e. “immersing in water” and “using wet burlap with nylon” were able to provide the minimum specified compressive and torsional strengths. With an increase in the concrete specified strength from C25 to C35, there was a decrease in the water permeation speed. Curing with chemicals had the highest speed and amount of water permeation in concrete, and curing through abandoning in the laboratory stood next. Also, curing by immersing in water had the lowest speed and the least amount of water permeation. Neville, A.M. (2011). Property of concrete) 5th Ed. (, Prentice Hall Pub. Mehta, P.K. Monteiro, P.J.M. Concrete: Micro-structure, properties and materials (3th Ed. (, Mc Graw-Hill, New York. Yang, C. C. Cho, S.W. (2003). Influence of aggregate content on the migration coefficient of concrete materials using electrochemical method. Materials Chemistry and Physics, No. 80, pp. 752 –757. Basheer, L. Kroop, J. and Cleland, D.J. (2006). Assessment of durability of concrete from its permeation properties: A Review. Construction and building materials, No. 15, pp. 93 – 10, 2001. Banthia, N. Biparva, A. and Mindess, S. (2005). Permeability of concrete under stress. Cement and Concrete Research, No. 35, pp. 1651 – 1655. Jain, A.K. Chauhan, J.S. Goliya, S.S. Effect of shape and size of aggregate on permeability of pervious concrete. Journal of Engineering Research and Studies, Vol. II, October–December, pp 48-56, 2011. Özen, M. (2007). Investigation of relationship between aggregate shape parameters and concrete strength using imaging techniques. Thesis of the Degree of Master of Science in Civil Engineering, University of Murat Özen,Turkey. Final Report National concrete pavement technology center. (2009). investigation into freezing-thawing durability of low-permeability concrete with and without air entraining agent. Tao, Ji. (2005). Preliminary study on the water permeability and microstructure of concrete incorporating nano-sio2. Cement and Concrete Research, No. 35, PP. 1943-1947. Researches First international concrete and development conference. (2004). Building and housing research center, Tehran. Montes, P. Bremner, T.W. and Castellanos, F. (2006). Interactive effects of fly ash and CNI on corrosion of reinforced high-performance concrete. Materials and Structures, Vol. 39, Issue 2, pp 201–210. Kolias S. and Georgiou C. (2005). The effect of paste volume and of water content on the strength and water absorption of concrete. Journal of Cement & ConcreteComposites, No. 27, pp 211-216. Ahmad, S. Azad, A.K. and Loughlin, K.F. (2005). A study of permeability and tortuosity of concrete. 30th Conference on Our World in Concrete & Structures, Singapore, 23 - 24 August. Hefnawy, E.El. Ibrahim, A.A. R.A. F. (2014). Comparative study on strength, permeability and sorptivity of concrete and their relation with concrete durability. International Journal of Engineering and Innovative Technology (IJEIT) Volume 4, Issue 4. Pp. 123-131. Building and Housing Research Center, N. Issue: 428, National durability of concrete code in Persian Gulf and Oman Sea, P.P. 34-35, 2014. Effect of concrete materials on permeability of concrete mixes used in MINNESOTA department of transportation paving projects. Minnesota Department of Transportation Office of Materials and Road Research, December 2009. Mehta, P.K. Kumar, P. Monteiro, P.J.M. (2006). Concrete microstructure, properties and materials: Advanced Concrete Technology, Mc-Grow Hill. Gomes, J.P.C.L.A. de Oliveira, P. and Perei, C.N.G. (2002). Discussion of aggregate and concrete water absorption and permeability testing methodology. World Congress on Housing Construction- An Inter- disciplinary Task, September 9-13, Coimbra, Portugal. Zhang, S.P. and Zong, L. (2014). Evaluation of relationship between water absorption and durability of concrete materials. Advances in Materials Science and Engineering, 8 pages. Zhang, F. Guo, L. and Chi, N.M.X. (2014). Coarse aggregate effects on compressive strength and permeability coefficient of non-fine concrete. EJGE, Vol. 19, PP.8905-8913. 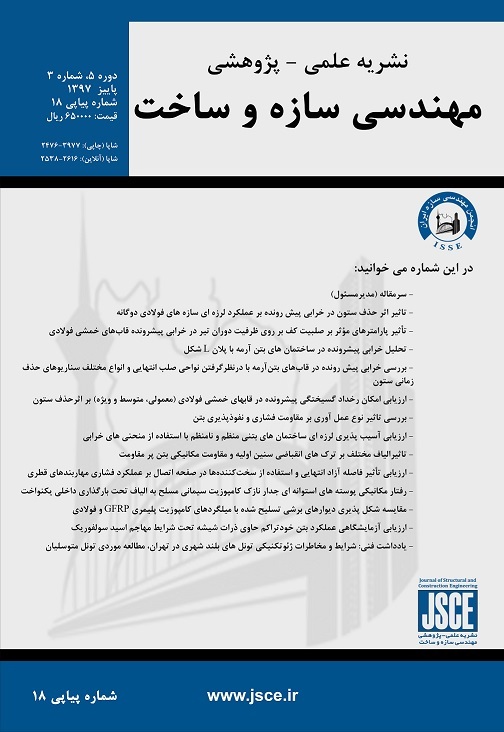 Ghiasvand, e. Zareee, b. Sharifi, p. Saraee, e. (2015). Effect variation of maximum of size of aggregate on permeability of common concretes, 7th annual national concrete conference, Tehran. Naderi, M. (2009). Ways to improve and determine of laboratory and in-situ strength of concrete, (first vol. ), published Roozbehan, Tehran. Ammar, Y. and Kabagire K. (2014). New approach to proportion pervious concrete. Construction and Building Materials, vol. 62:38-46. Cervo, T.C. Balbo, J.T. Badawy, M. Severi, A.A. (2010). Influence of curing procedures and porosity in the flexural resistance of concretes for paving. IBRACON Structures and Materials Journal, Vol. 3, No. 4, PP. 390 – 395. Wanga, K. Youngb, F. Aldeaa, C-M. P.Shaha, S. (2000). Effects of curing conditions on properties of concrete using slag replacement. Cement and Concrete Research, Vol. 30, Issue 3, Pages 465–472. Gu, Ch. Sun, W, Guo, L. (2016). Wang Q, Effect of curing conditions on the durability of ultra-high performance concrete under flexural load. Journal of Wuhan University of Technology-Mater. Sci. Ed., Volume 31, Issue 2, pp 278–285. Ming-fang, B. Chun-xiang, Qian. Xin-jun, Guo. Xiang-yang Han. (2011). Effects of steam curing on strength and porous structure of concrete with low water/binder ratio. Construction and Building Materials, Volume 25, Issue 1, Pages 123–128. Elkhadiri, I. Palacios, M. Puertas, F. (2009). Effect of curing temperature on cement hydration. Ceramics – Silikaty, Vol. 53 (2), Pages 65-75. Family, H. Tadayon, M. Siminpour, M. (2011). Effect of steam curing on the capillary water absorption and electrical resistivity parameters of traditional prefabricated concrete tables, 2th national conference concrete, Tehran, Iran. Zeyad, Abdullah M. (2017). Effect of curing methods in hot weather on the properties of high-strength concretes, Journal of King Saud University - Engineering Sciences, online. Ibrahim, M. Shameem, M. Al-Mehthel, M. Maslehuddin, M. (2013). Effect of curing methods on strength and durability of concrete under hot weather conditions. Cement and Concrete Composites, Volume 41, Pages 60–69. Atiş, C.D. Özcan, F. Kılıç, A. Karahan, O. Bilim, C. Severcan, M.H. (2005). Influence of dry and wet curing conditions on compressive strength of silica fume concrete. Building and Environment, Volume 40, Issue 12, Pages 1678–1683. Lee, S.T. (2008). Effects of curing procedures on the strength and permeability of cementitious composites incorporating GGBFS. Journal of Ceramic Processing Research, Vol. 9, No. 4, pp. 358-361. Akeem, A.R. Aliu, A.S. Amaka, J.E. (2013). Effect of Curing Methods on Density and Compressive Strength of Concrete, International Journal of Applied Science and Technology, Vol. 3, No. 4, pp. 55-64. Kefeng, T. Odd E. Gjorv. (1996). Performance of concrete under different curing conditions. Cement and Concrete Research, Vol. 26, Issue 3, Pages 355-361. Naderi, M. (2010). Determine of concrete, stone, mortar, brick and other construction materials permeability with cylindrical chamber method. Registration of Patent in Companies and industrial property Office. Reg. N. 67726. Iran. Taheri, M. (2011). Laboratory measurement of concrete permeability with cylindrical chamber method. MSc Thesis, International Imam Khomeini University. Naderi, M. and et. al. (2011). Laboratory determined permeability of concrete with cylindrical chamber method. First international conference of un-permeable concrete- Drinking water of storage tanks, Water and sewer, Guilan, Iran. Naderi, M. (2002). Registration of Patent in Companies and industrial property Office, Twist-off method, Iran. Naderi, M. (2006). Assessing the in situ strength of concrete, using new Twist-Off method. International journal of civil engineering, vol.4, No.2. pp. 146-155. ASTM C136 - 06 Standard test method for sieve analysis of fine and coarse aggregates. ASTM C150 / C150M - 09 Standard specification for Portland cement. ASTM C309 - 11 Standard Specification for Liquid Membrane-Forming Compounds for Curing Concrete. Naderi, M. (2007). New Twist-Off Method for the Evaluation of In-Situ Strength of Concrete. Journal of Testing and Evaluation, Vol. 35, No. 6, pp. 602-608. Naderi, M. Roostaei, H. (2013). Estimation of Concrete Strength in Sewer Systems. Journal of Water & Wastewater, Vol 4, pp. 51-64. Naderi, M. and Shibani, R. (2013). New Method for Non-destructive Evaluation of Concrete Strength. Australian Journal of Basic and Applied Sciences, Vol. 7(2), p.p. 438-447. Mamlouk, M.S. and Zaniewski, J.P (2006). Materials for Civil and Construction Engineers (2nd Ed. ), New Jersey, Pearson Prentice Hall. GnanaVenkatesh, S. Arun, M. Arunachalam, N. (2014). Effects on Concrete Strength by Three Types of Curing Methods. International Journal of Engineering and Management Research, Vol. 4(6), pp. 6-8.